comment 4 days park to park admission to Disney's original Californian dream! 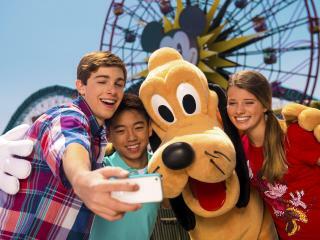 4 days admission to both Disneyland Park and Disney's California Adventure Park. Additionally, the 4 Day Disneyland California Hopper Ticket is valid for a 13 day period which means you do not have to visit Disneyland California over consecutive days. Tickets are activated the first time they are used and expire after 13 days even if you have not used all your days. Spend less time in line and more time having fun! Disney’s Standard FASTPASS® Service is free to guests and lets you make the most of your Disney Ticket by saving your place in line while you enjoy the rest of the park. Simply go to anyStandard FASTPASS® attraction and use your Disneyland® admission ticket to obtain a Standard FASTPASS® ticket with a one-hour window of time printed on it. Return any time during that window and enjoy the attraction with only a minimal wait. You will be sent a REAL Disneyland California Hopper e-Ticket not a voucher, ensuring minimum fuss when you arrive at Disneyland Resort California. There is nothing to redeem and you simply go straight through the gate on arrival. Your Disneyland California Hopper Ticket is valid for 4 days within a 13 day period - you do not need to visit the park over consecutive days. All customers must be resident in the UK, Ireland or Europe to purchase this product as you will receive an actual park ticket in the post. This means you can go straight into the parks without queuing to redeem a Ticket Voucher.